I spoke to R, my very close relative in Baghdad...his health is not good at all. He is a cardiac patient, he just lost his wife who died very suddenly...and he lost his job. Of course he lives in a Sunni ghetto. - What are the readings ? R. told me briefly. His blood test values are not normal range at all...some are too elevated and require urgent attention, like very urgent. - go find another one, this one does not seem to know anything...there's not much I can do from here except give you a diagnosis with different possibilities as to why these blood values are not normal...you really ought to see a specialist like now ! - What do you mean you can't...Is it money ? - What ?! What have the elections got to do with your seeing a specialist immediately ? - Laylaaaaaa can't you understand we can't leave the house at all ?! - Listen I know all about the "Katem", the silencer gun, but to that extent ? I could not reply anything...what can I say -- Brave the bullets so you won't die from a heart attack ? What on earth has gripped Iraq since the SAVAGE Americans and their coalition of animals invaded us ?! "What's the population of Iraq?" and one of his assistants replied " about 24 million "
"That much? Let's bring it down to 5 million. That should be enough"
It seems also that well over 600 so-called "Baathists" will be chucked out from the ministries of Interior and Defense. * Thanks A.H for some of the info. Picture : 1876. 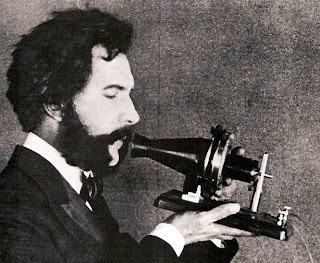 Bell speaking into a "telephone"